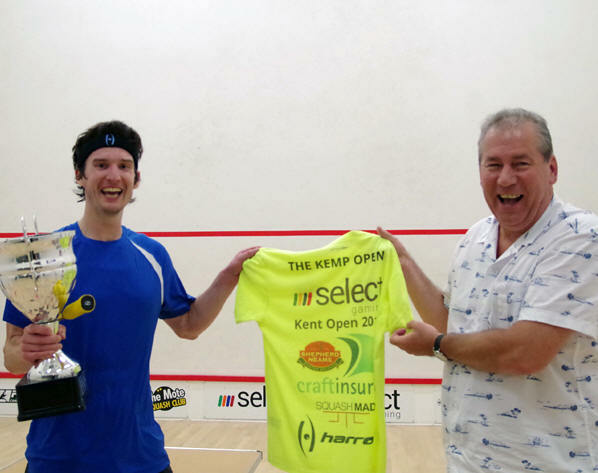 Jonathan Kemp brought the curtain down on a distinguished career in impressive style by winning the Select Gaming Kent Open final against Australian top seed Steve Finitsis. 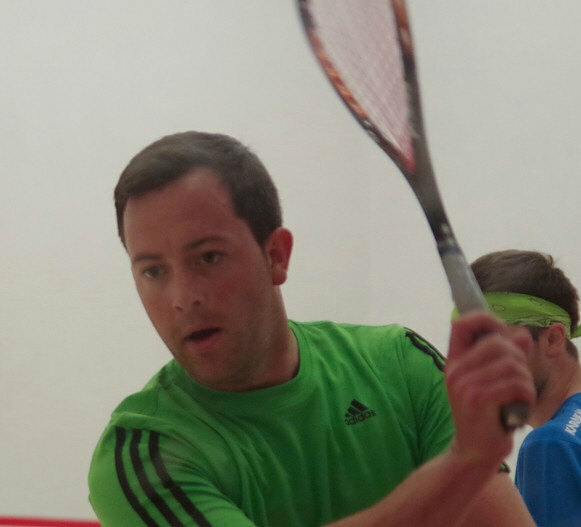 Kemp delighted the packed gallery at The Mote Squash Club in Maidstone with a devastating display of skill as he reeled off a succession of winners into the front corners. Local fans had renamed the front right area of the court Kempy’s Corner in tribute to his cultured backhand drop shots. However, he was forced to battle hard throughout the match by his tenacious opponent, who frequently matched Kemp’s quality in that very same corner. 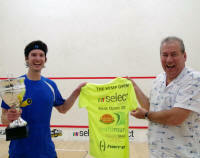 The opening rallies were full of intelligent, patient squash as Kemp built a 9-5 lead. Finitsis then enjoyed a purple patch to lead 11-10 before Kemp regained control to nick it 13-11. Finitsis, the 32-year-old world No.50 who is based in The Hague, began the second game well to lead 5-2. Kemp drew level at 5-5 and 6-6 but Finitsis won four points in a row to hold game ball. Kemp hit back again to make it 10-10 but Finitsis hit two quick winners to level the match. Kemp surged ahead in the third to lead 6-2 and then 9-4 and although Finitsis recovered to take four more points, the 33-year-old left hander from Ipswich closed out the game 11-8. Finitsis won the first three of points of the fourth game constructed a run of six points to move within touching distance of his second Kent Open title. Finitsis fought back to draw level at 8-8 and 9-9, but Kemp won the final two points to end his career on a positive note. As well as receiving his trophy for a second year, the champion was presented with a special commemorative shirt with the words “The Kemp Open” on the back. Top seeds Steve Finitsis and Jonathan Kemp will meet in the final of the Select Gaming Kent Open after seeing off Todd Harrity and Richie Fallows in two entertaining semi-final battles. Finitsis overcame Harrity 11-5, 11-3, 11-6 in 38 minutes of controlled driving. Harrity knew what to expect after seeing Finitsis dominate earlier opponents but could not match the quality or the consistency of the Australian world No.50. Harrity battled manfully but was too frequently worked into awkward contortions trying to retrieve situations set up by his opponent’s relentless accuracy. Finitsis has worked out all the angles and nuances of The Mote’s showcourt, and his backhand crosscourts frequently found a dying width and length. The straight stuff is phenomenal. The crosscourts, to a dying length, are more difficult, but he’s mastered the pace and angles to perfection. It will be a fascinating final against Jonathan Kemp. Kemp knows those angles off by heart. He overcame the fierce resistance posed by Richie Fallows in an absorbing contest that was full of top-quality squash with endless variety. Fallows took on Kemp in drop-shot contests, matched him for width and length, and for most of the game kept his trap shut, which was a major improvement on the previous evening. Kemp, however, works the ball into areas of the court that can embarrass even the best of players, and his tight, soft backhand drops and volley drops, on to Fallows’ forehand, clung so tightly to the side wall that Richie had nothing to hit. It’s a fascinating concept, to hit drop shots deeper into the court, into an area where 99.9 per cent of adult males want to rush in and bash a big crosscourt, only to find there’s nothing to hit. It works. And learning how to deal with it is all part of Richie’s education. He has performed admirably this week, but Kemp clearly is not ready to retire just yet. Just when you think he’s looking tired, he produces the most phenomenal array of shots to work his way back into a position of control. Tomorrow’s final will be his last PSA match. It promises to be a classic. Playing Finitsis will be fascinating contrast of styles. I hope Fallows will be back next year to build on the tremendous progress he has displayed this week. He has an important role to fulfil as a motivational presence for the next generation of young, ambitious players. Kemp, meanwhile, shines a light for the game as a smiling, technical genius. RICHIE FALLOWS lit the celebration candles on his19th birthday cake three days early last night after storming into the semi finals of the Select Gaming Kent Open at The Mote Squash Club in Maidstone. The European Junior champion from London, the only unseeded player in the last eight, came through a brutal 89-minute barn-stormer with Scotland’s Greg Lobban to set up a showdown with Jonathan Kemp today. In a thrilling five-game classic, the England-Scotland rivals threw everything at one another in the match of the tournament so far. Fallows took the first and third games but couldn’t shake off the higher ranked man from Inverness. 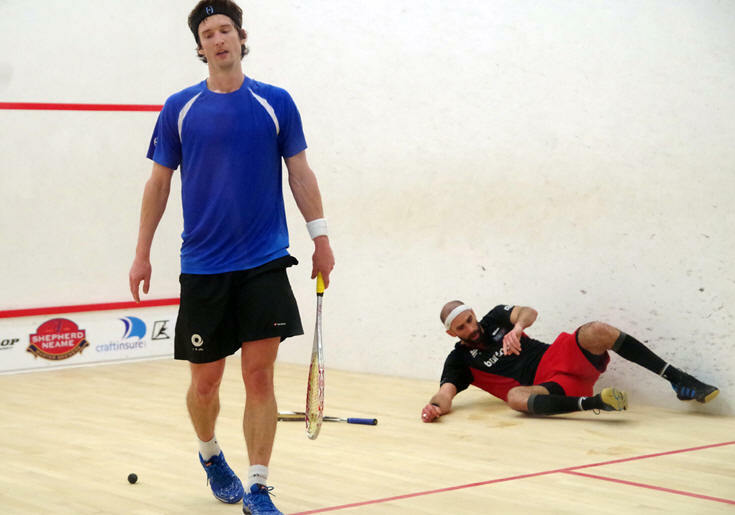 Lobban, 34 ranking places higher than Fallows at 71 in the world, took resilience to a whole new level as he dug in, retrieved with breathtaking athleticism and forced the match into a decider. 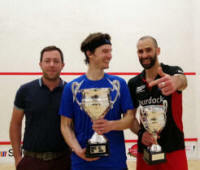 But West Ham fan Fallows is running on full confidence after his first PSA win a fortnight ago in Switzerland and he got over the line with an equally gutsy display in the fifth. The 11-4, 10-12, 11-8, 8-11, 11-3 scoreline told only half the story. The rapturous applause for both players at the end signaled they had witnessed a classic that mixed brutal physical investment with an amazing array of racket skills, with the referees also keen to join in the action. Jonathan Kemp, the reigning Kent Open champion playing his farewell PSA tournament, marched into the semi-finals with an imperious, late-night display against the in-form Ben Coleman. Coleman, with three recent PSA tournament victories under his belt, won a tight first game 11-8, but Kemp typically began playing more solidly once his body warmed up. He opened up a 5-2 lead and maintained his advantage all the way through. The third game was the deciding battle. And Kemp won it with the occasional, but beautifully timed, reverse angle. So many younger players are coached out of playing this particular shot that they call it an old man’s shot, or a club player’s shot. However, if you are a world-ranking professional and you are constantly deceived by it, my advice is to offer a warm round of applause and get on with the game. Apologies for digressing. Kemp weathered a fierce storm and fought back from 10-7 down to win 15-13. Coleman’s head dropped in the fourth and the winners, and one or two more reverse angles, flowed from Kemp’s racket as he mopped up 11-3 to book his place in the semi-finals. Todd Harrity, meanwhile, produced a phenomenal recovery in the fifth game to upset the seedings and knock out No.3 seed Charles Sharpes in another dramatic quarter-final. The American world No.92 fought back from the seemingly hopeless position of 9-4 down in the fifth game with an astonishing succession of winners. He reeled off seven points in a row as Sharpes, the world No.62, suddenly found his touch drying up. The match was close all the way through, with Sharpes winning the opening game 13-11 courtesy of two tins from his opponent from 11-11. Harrity won the second 11-8 but Sharpes was in outstanding form as he nailed the third 11-2. Harrity was far from finished as he won the fourth 11-5. Sharpes dominated the early stages of the fifth and moved from 4-1 to 7-2, then to 9-4. A place in the semi-finals beckoned but a dramatic swing of fortune occurred as Harrity feathered in a succession of drops and volley drops after some brutal rallies. Harrity now meets top seed Steve Finitsis in a further examination of his credentials. The challenge of England’s Declan James foundered at the hands of number seed Steve Finitsis, although his defeat could probably be traced back 24 hours. James, the world number 78, battled through a 92-minute first round affair with Chris Fuller that drained the reserves and left him facing a huge challenge against the super fit Aussie who had spent half the court time disposing of his first round opponent. Australian top seed Steve Finitsis, American star Todd Harrity, and Scottish number two Greg Lobban join five English players in the quarter-finals of the Select Gaming Kent Open. This PSA $10k, celebrating its fifth year at The Mote Squash Club in Maidstone, England, once again provides a platform for rising home talent to impress on the international stage. Assistant national coach David Campion was present to check the progress of many of his charges with five all-English battles on the schedule. In the longest match of the night, No.6 seed Declan James beat his Nottingham team-mate Chris Fuller in a 92-minute marathon. James meets top seed Finitsis in the last eight after the tall Australian overpowered Youssef Abdalla in straight games. European junior champion Richie Fallows took just 24 minutes to beat Pakistan's Adil Maqbool to set up a quarter-final clash with Scotland's No.4 seed Greg Lobban. 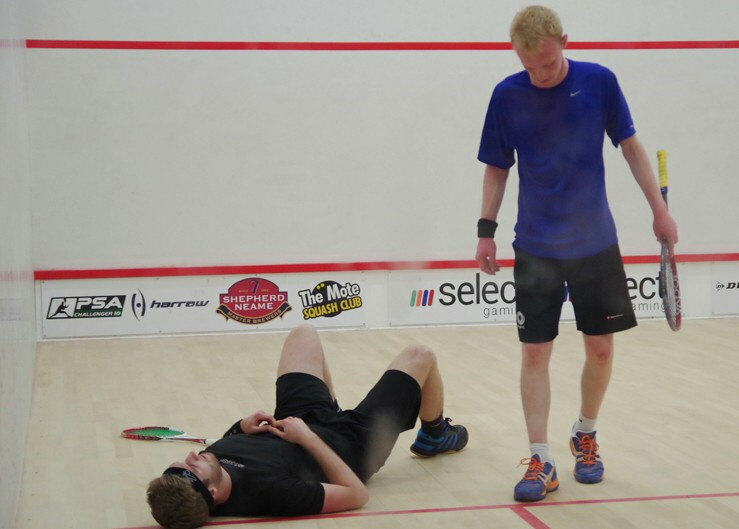 Bizarrely, Lobban lost the second game 11-1 but hit back to beat young England hopeful Tom Ford 3-1. Second seed Jonathan Kemp, the reigning Kent Open champion, also lost a game for just one point but he too hit back to win a tough battle with Yorkshire fighter James Earles. Kemp, who is appearing in his final tournament after announcing his retirement from the PSA Tour, faces a tough quarter-final against the in-forrm Ben Coleman, who won a brutal battle with 18-year-old qualifier George Parker. American No.7 seed Harrity beat qualifier Mike Harris in straight games and now meets No.3 seed Charles Sharpes. The British Under-23 champion withstood fierce pressure in the first game against wild card Steven London to win from 8-7 down but then took control to win the next two games 11-3. Youssef Abdalla ended the run of The Mote's James Evans and was rewarded with a tie against top seed Steve Finitsis in the first round of the Select Gaming Kent Open. James Earles' reward for beating Sam Ellis is a tie with number two seed Jonathan Kemp in this PSA Challenger 10 event in Maidstone, while Mike Harris faces American Todd Harrity after surviving a marathon match with Phil Nightingale. George Parker overcame Reuben Phillips and now meets Ben Coleman. Harris led by two games to love before Nightingale mounted a massive recovery to take the match to a fifth game. Even when he is tired the 6ft 5in Nightingale's phenomenal reach keeps him in the rallies, but Harris regained his control to take the fifth 11-5 to clinch victory in 72 minutes. Abdalla won the first seven points of his match to silence a packed gallery who had come to to support home hero Evans. The Invicta Grammar School head boy worked his way into the match and the second game was a massive battle. Evans led 8-5 and survived a flurry of points from Abdalla to win it 10-8. However, the effort drained his reserves of energy and Abdalla was able to build a big lead at the start of the third and fourth games as his tired opponent struggled to find any rhythm. Parker played solid, powerful squash to topple the higher-ranked Phillips, who announced after the match that he was taking a long break from the game this summer. Earles will fancy a crack at number two seed Kemp, who recently announced his impending retirement from the PSA Tour. But Ellis was kicking himself after squandering an 8-2 lead in the second game. Earles powered through the third as Ellis found his touch and control deserted him. The Mote’s James Evans repeated his Kent Open victory over Scotland’s James Geekie to reach the qualifying finals of the Select Gaming Kent Open. Playing on his favourite home court, Evans claimed another straight-games victory but it required a monumental fightback in the third after trailing 10-4 to his much taller opponent. Evans won 12-10, 11-7, 12-10 in 43 minutes of entertaining squash that had the packed gallery roaring their support and groaning in despair as the score see-sawed one way then the other. Fresh from an exam at Oakwood Park Grammar School, where he is head boy, Evans raced into a 5-1 lead in the opening game before falling off the pace and allowing Geekie to hit back to lead 7-5. Evans hit back to lead 10-9 and despite Geekie levelling the scores he closed out the game 12-10. Evans was much tighter in the second game, building another 5-1 lead and surviving another mid-game wobble. Geekie dominated the opening stages of the third game to lead 9-3 and he reached game ball at 10-4. However, Evans showed great resilience and tenacity to win eight points in a row to win the match as the home crowd cheered him home. He faces talented Egyptian-born Londoner Youssef Abdalla in the qualifying finals. 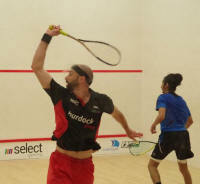 Abdalla took just 24 minutes to overcome Nick Mulvey 11-3, 11-3, 11-7 with a devastating display of attacking squash. Evans’ Kent team-mate Josh Masters was an early casualty, going down in a high-paced encounter with George Parker. Masters led 9-5 in the third but tinned a drop shot which led to Parker mounting a determined recovery to close out the match 11-6, 11-5, 13-11 in 43 minutes. The longest match of the night saw Phil Nightingale beat Phil Bull in five games to claim a place in the finals against top qualifying seed Mike Harris, who had enjoyed the shortest encounter of the evening, an entertaining stroll with title sponsor Jonny Powell. Parker meets Londoner Reuben Phillips, who withstood a third-game fightback from Pakistani Suleman Khan to win 11-5, 11-4, 12-10. Sam Ellis meets number two seed James Earles after both enjoyed straight-games victories against Anthony Brindle and Joel Makin. 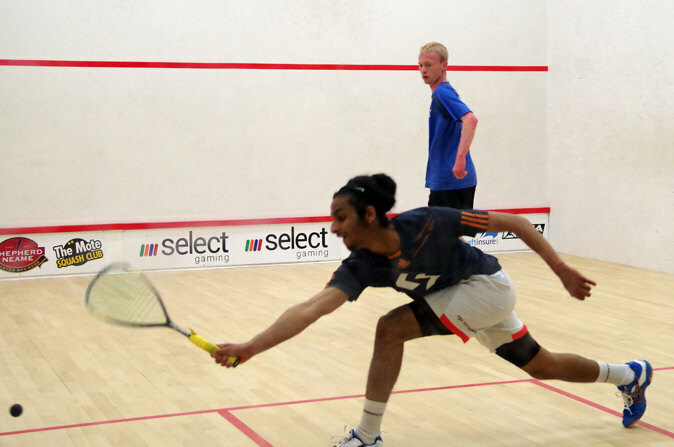 The Select Gaming Kent Open squash tournament was forced to overcome a last-minute drama when top seed Ali Anwar Reda was forced to withdraw. The world No.41 from Cairo was unable to secure a visa to leave Egypt. This forced a reshuffle of the draw and promoted top seeded qualifier Richie Fallows, the European junior champion who trains at Bexley, into the main event at The Mote. Fallows, who is coached at Bexley by Ben Ford, meets Pakistan’s world No.98 Adil Maqbool fresh from winning his first PSA title in Kriens, Switzerland. The Kent Open begins on Sunday 8th June with a pre-qualifying tournament which pitches eight locals in with the professionals. 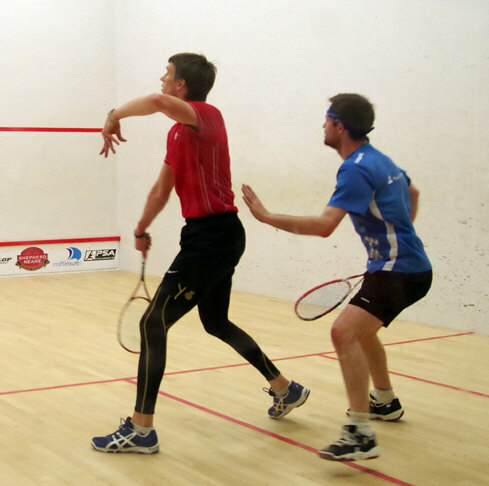 Eight days of top-class squash come to a close with the final on Sunday June 15. Australian Steve Finitsis takes over as number one seed with reigning champion Jonathan Kemp at two. Both meet qualifiers in the first round of the main draw. British Under-23 champion Charles Sharpes, from Surrey, is installed as No.3 seed with Scotland’s Greg Lobban at four. Sharpes tackles Kent’s wild card Steven London, from Park Langley, while Lobban meets in-form England youngster Tom Ford, who recently won the Pretoria Open in South Africa. Another English player in form is Essex ace Ben Coleman, who has completed a hat-trick of tournament wins in the past month in Aberdeen, Ipswich and Madrid. He is seeded to meet Kemp in the quarter-finals. Not only is an all-English showdown on the cards, but a Coleman win would bring down the curtain on a distinguished career for the stylish left-hander Kemp, who has announced his retirement from the PSA Tour at the age of 33. The Kent Open will be his final event and Tournament Director Alan Thatcher said: “I am sure Jonathan would love to go all the way and win his final PSA Tour event. He made a lot of friends at The Mote last year and he is a wonderful role model. “He plays with style and a smile and however well he performs we will honour his contribution to the sport with a special presentation. The Kent Open is celebrating its fifth year as a PSA world-ranking tournament at The Mote. All four winners so far have used Harrow rackets: Alan Clyne, Chris Ryder, Chris Simpson and Jonathan Kemp. The Pre-Qualifying tournament starts on Sunday, with Mote members Adrian Humphries, Darren Heathfield, Matt Hazzard, Paul Newvell, Marcus Robson and Jason Goodayle, joining Canterbury pair Joe Magor and Tom May in a shoot-out with eight pros (including Maidstone’s Bradley Masters). The two winners go through to the Qualifying Tournament on Tuesday and Wednesday alongside The Mote’s James Evans and Jonny Powell, and Maidstone’s Josh Masters. Total prize money for the Kent Open is 10,000 dollars (roughly £6,000). The winner takes home just under £1,000. The Kent Open features free coaching sessions from the professionals for local juniors each day next week. The sessions start at 4pm from Tuesday to Friday. A free Ladies Day session starts at 1pm on Saturday week, the day of the semi-finals. The finals weekend is being billed as the biggest party in squash, with a variety of fun events built into the schedule around the semi-finals and the finals. A doubles tournament will be staged with cash prizes attracting some serious teams from around the south of England.